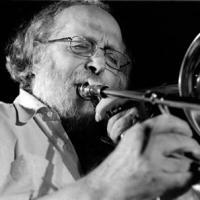 Born in Rome, where he still lives, trombonist Giancarlo Schiaffini is a key figure in both Italian new music and the European improvised music scenes, playing with Evan Parker, Maarten Altena, Barry Guy, and recording with Andrea Centazzo and Lol Coxhill, among others. Self-taught on the instrument, Schiaffini studied and earned degrees at Darmstadt, operating in the academic avant-garde realm with the improvising group Nuova Consonanza, and playing solo compositions by Berio and Scelsi. He's also the designated soloist for Luigi Nono's Prometheus, and is a conservatory teacher. On the more experimental side of his work, Schiaffini makes creative use of electronics, as documented on Edula (Pentaphon) and The Missing Chainring (Imprint, 2001), as well as in his textbook on contemporary trombone techniques. Yet Schiaffini does not renounce his jazz roots, which is equally evident in his improvisations, in his teaching activities for the Siena Jazz Courses, as well as in his original tributes to the music of Charlie Parker and Thelonious Monk, As a Bird and About Monk (Pentaflowers). Join us as we air an interview and in-studio performance with Schiaffini this Sunday at 10pm.